Craving pasta? Cook with spaghetti squash instead! Could you imagine piling your plate high with spaghetti goodness? Warm, savory, comforting, carby goodness. When I was growing up, I used to eat spaghetti before my track meets, and would stock up on Ramen Noodles when I first moved out on my own. Noww I look at spaghetti and think, “meh I’m not really getting a burst of nutrients through this carb”, so I rarely eat spaghetti..ever. I will admit though that when I’m craving something warm and comforting a big bowl of spaghetti would be da bomb. So naturally I searched for a nutrient dense substitute for spaghetti and I stumbled across spaghetti squash. All I can say is YASS. Spaghetti squash is currently my jam n’ jelly. It is super low calorie, keeps you feeling full from fiber, and keeps our metabolism working properly with the help of manganese. 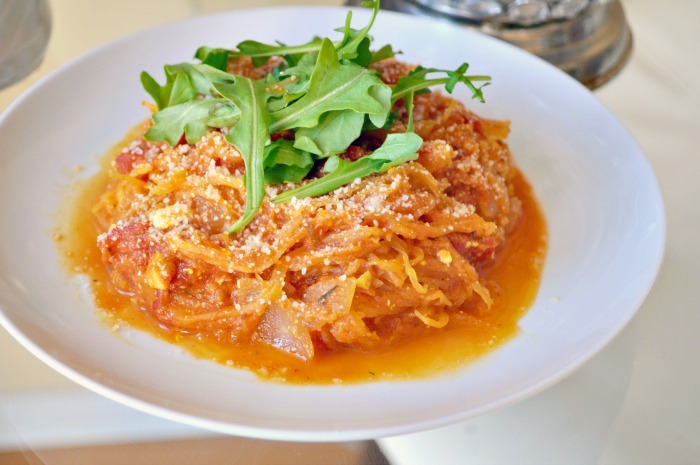 Spaghetti squash also keeps your skin in tip top shape since it contains Vitamin A in the form of beta-carotene. So clearly I’m going to be eating spaghetti squash whenever I want pasta so that I can satisfy my carby craving aaaand give my skin an extra boost. In a sauteeing pan, saute the onion and garlic (dice both), until translucent, and add the Passata sauce and diced tomatoes. This dish looks awesome and delish. I'll try it soon. Thanks for sharing!